Solar-powered lights shine at a new bus shelter at Avenue C and East 16th Street, which had gone without lights since 2009. STUYVESANT TOWN — The lights are finally on at a Stuyvesant Town bus shelter that has been dark for years at an intersection where some residents blamed a fatal 2013 collision on poor lighting. New York's first solar-powered bus shelter was installed at the southbound M9 bus stop at East 16th Street and Avenue C last week, bringing light to the shelter for the first time since 2009. Residents have avoided using the stop for years and, in 2013, a Department of Sanitation truck fatally struck 88-year-old Stella Huang as she crossed East 16th Street, a tragedy that many blamed on the area’s poor lighting, according Stuy Town resident and member of the Community Board 6 Transportation Committee Lawrence Scheyer. “People just didn’t use that shelter after dark,” he said. 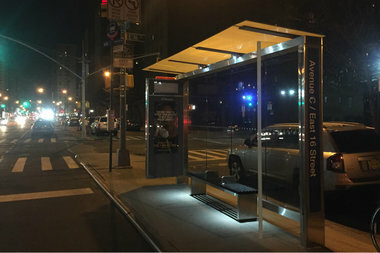 JCDecaux installed the new solar-powered shelter on behalf of the city after years of complaints from Stuy Town residents that the bus stop was creepy and dangerous. JCDecaux is testing out the panels at the Avenue C bus stop in order to feel out the possibility of installing similar set-ups at other unlit bus shelters throughout the city, according to a Department of Transportation spokeswoman. The shelter was built at no cost to the city as part of the franchise contract JCDecaux has with the DOT, the spokesman said. The Avenue C bus stop went dark in 2009 when construction by Con-Ed disconnected the shelter from its power source, according to Scheyer. He praised the installation of the shelter but criticized the city for taking so long to do it. “We’ve been fighting for this forever and I’m delighted that the situation finally inspired some creativity,” he said.